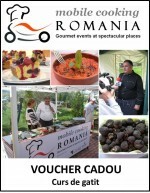 Mobile Cooking Romania is a tourism concept based on an initiative of Carpathian Tourism Cluster Romania with the target to promote culinary tourism in Romania. The modules comprises the full organisation (transport of cooking and catering equipment, chef plus team, location arrangement etc,) and can be included in existing or new tours. The modules are available with advantageous prices for tour operators and travel agencies.